U.S. Navy Chief Petty Officer Adam Fleck receives a Quilt of Valor from Ruth Ann Bosworth of the South Jersey Quilts of Valor Foundation during Longport’s Wounded Warrior Week 2018. SEAVILLE – John Watson thought he was going to a party with his stepdaughter Ashley Hennessey. 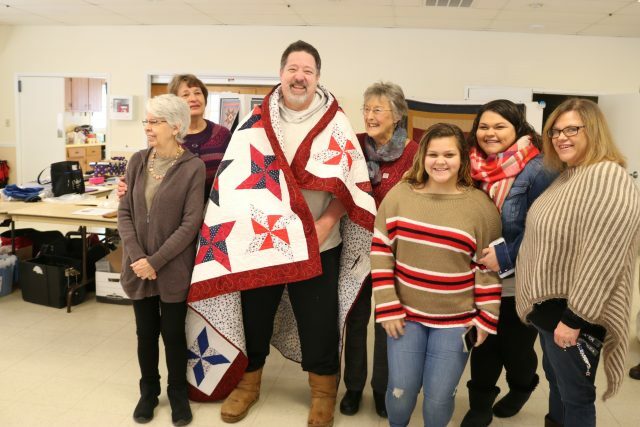 Instead, when he walked into the Seaville Fire House on Saturday afternoon, he was moved to tears by a gesture by Ashley and the work of members of the South Jersey Quilts of Valor Foundation. 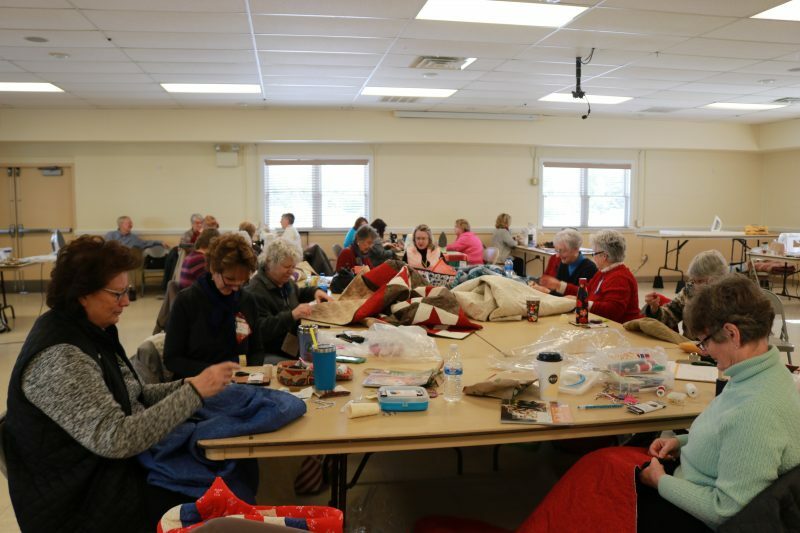 The retired Air Force staff sergeant was greeted by about 60 quilters who united for National Sew Day to stitch quilts for members of the military and to present some quilts to veterans. Quilters who filled the room applauded as Kathy Tweed, a longtime member of the organization, presented Watson with his quilt. “This is memorable. 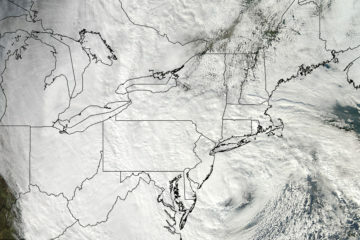 Thank you,” Watson said, wiping away tears. His wife Angel, and stepdaughters Ashley and Abigail Hennessey, were by his side during the moving ceremony. Air Force veteran John Watson of North Cape May is moved when he receives a Quilt of Valor from the South Jersey Quilts of Valor Foundation at the Seaville Fire House while accompanied by his family and foundation members. Ashley Hennessey said she nominated her stepfather because he believes in the military. “I know how important it is to him that he served us, and I am very proud of what he did for us and for the country,” Hennessey explained. Retired Army Corporal Bill Giambatista, 83, of Egg Harbor Township, who served in the Korean War, also received a quilt Saturday. His wife, Gini, stood by his side as he received the honor, which was wrapped around him. Gini and Bill Giambatista, a retired Army corporal, pose with a quilt he received moments before. Giambatista was nominated for the quilt by members of his community, he said. “I’m overwhelmed by the work that was put into my quilt and by the work put into all of the quilts,” he said. His wife was so pleased, she joined the foundation. “I’m so excited about being a part of this,” Gini Giambatista said. Some quilters worked steadily through the day on quilts after just receiving ones themselves recently. Navy veteran Diana Easterday, of Mays Landing, was presented with a quilt last November. Liz Barret, left, of Upper Township, and Navy veteran, Diana Easterday, of Mays Landing, display their work. 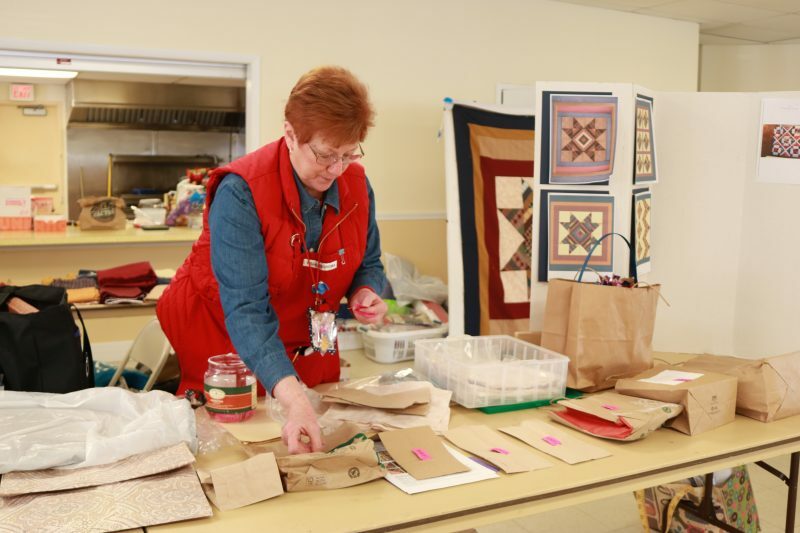 She and Liz Barrett of Upper Township, who is a leading member of the local Quilts of Valor Foundation, sat together, chatted and sewed some vibrant pieces they put together to one day be given to a service man or woman to honor them and show them gratitude. Easterday said she enjoys quilting to give back and let others in the military know how much their sacrifice means to them. 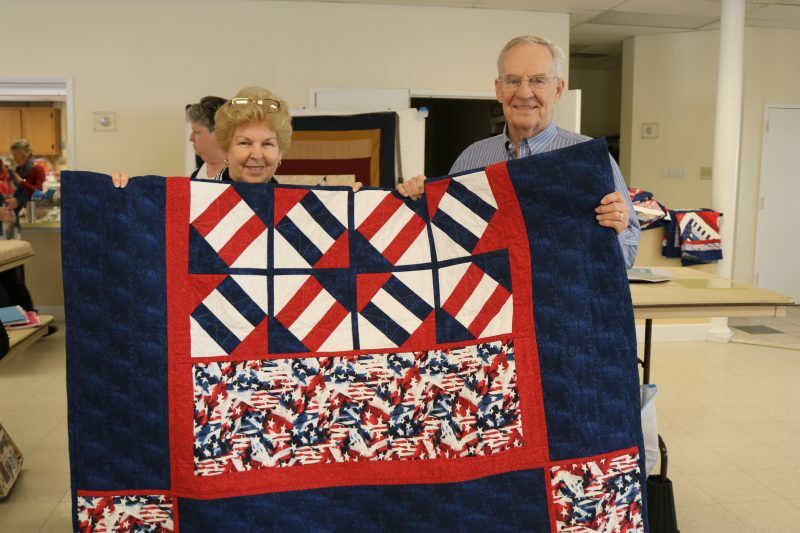 On average, the foundation members make about 100 quilts a year that are presented to veterans around South Jersey. Barrett, Ruth Ann Bosworth and Crystal Smith have been instrumental in the foundation, members said. The organization grew over the last decade. 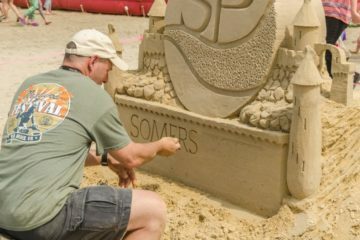 It started out in a basement with a few people, which included Barrett, and has grown into what it is today, with about 100 active members. 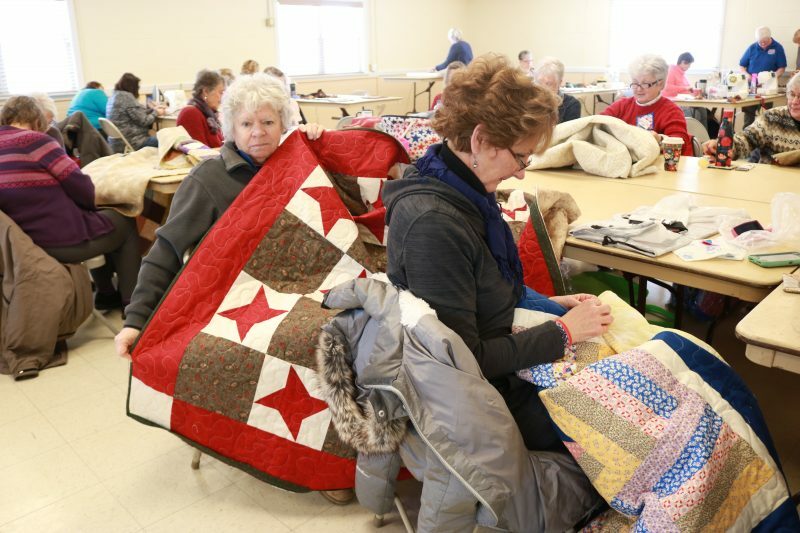 Quilters work to create vibrant quilts for veterans. Like Ashley Hennessey and the Giambatistas’ community, the foundation receives nominations through family members, organizations, clubs and churches. Presentations are done at homes and at facilities, including council chambers, VFW and American Legion posts and other places to accommodate the veterans. Barrett said she has presented quite a few quilts over the years in towns throughout South Jersey. A member of the Quilts of Valor presented U.S. Army Reserve Capt. 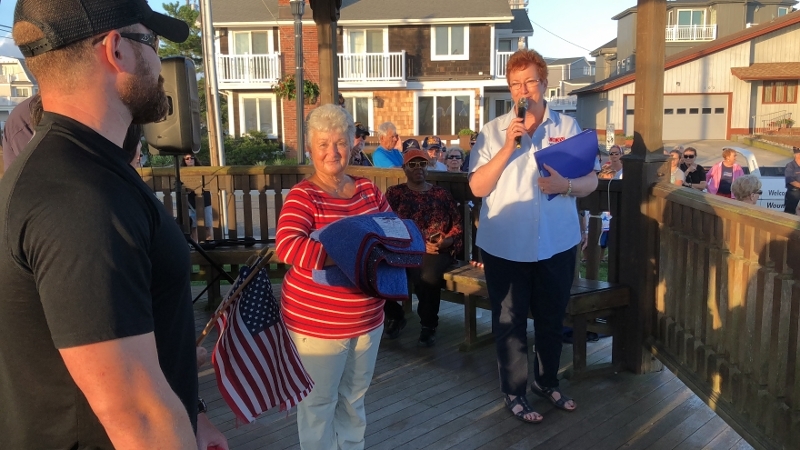 Joanne Schultze with a Quilt of Valor in June during a ceremony at Ocean City’s American Legion Post 524. 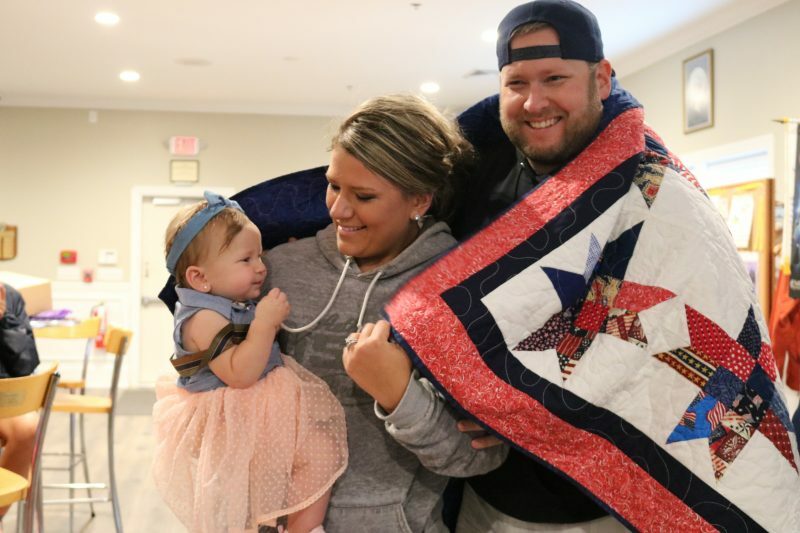 Marine Corps Lance Corporal Bobby Raditz with his wife Erika and their daughter, Emma, wrap themselves up in a Quilt of Valor at the Ocean City American Legion Post 524. In September, a quilt was given to Marine Corps Lance Corporal Bobby Raditz at American Legion Post 524. Quilts of Valor volunteers present Adam Fleck with one of their colorful creations. 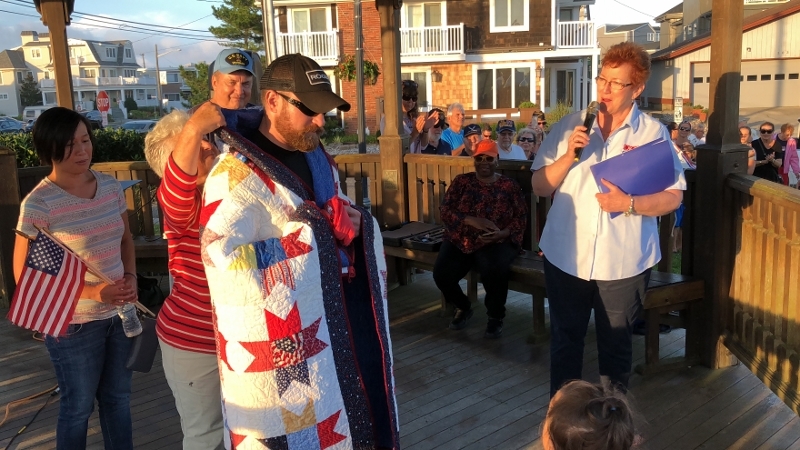 Also that month, a quilt was presented to U.S. Navy Chief Petty Officer Adam Fleck, who was Longport’s 2018 Wounded Warrior Week recipient. 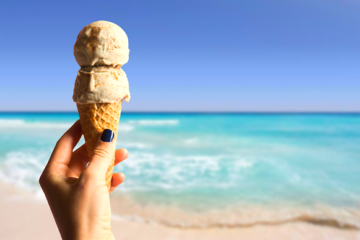 Along with the quilt, Fleck was treated to a week-long vacation in the beach-block home of a donor, all courtesy of the Longport American Legion. Last month, Barrett awarded Vietnam veteran Ronald DelOrefice with a quilt during a Sea Isle City Council meeting. Barrett, Bosworth and Smith split up some of the work of creating the quilting kits for the foundation. “We make up the kits and bring them to the work sessions. The fabric is cut and the gals piece them together to make the quilt tops,” Barrett explained. Quilts of Valor member Ruth Ann Bosworth is one of the leaders of the foundation. Smith has an important job of putting it all together. She said there are others in the foundation who also do it so she can’t take all of the credit. “I sew the sandwich together,” she said with a laugh as she described the quilt top and bottom and stuffing in-between. Some of the quilters like to make their creations on the newest sewing machines, while others stick to the tried and true. Kathy Tweed, of Cape May Court House, said her family members have served in the military dating back to the Revolutionary War. She likes to do some things the old-fashioned way. She uses a 1940s-era sewing machine that once belonged to her mother-in-law to create quilt blocks. As of June 2017, the national organization, the Quilts of Valor Foundation, had awarded more than 161,400 quilts. For more information about the Quilts of Valor Foundation, visit www.qovf.org/state-coordinators/new-jersey/ or see the South Jersey Quilts of Valor Chapter’s Facebook page.